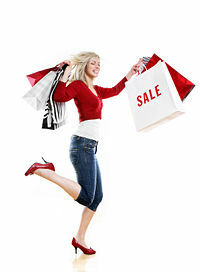 National Splurge Day is a holiday you can really have fun with. Splurge on yourself, splurge on someone else. This is the day to go crazy with that charge card and hope that your bank account will forgive you in the morning. This holiday was created and copyrighted by Adrienne Sioux Koopersmith in 1994. Her inspiration is that being 63 days after Tax Day that most people should have their Income Tax Refund checks and should celebrate with a special splurge. This page was last modified on 26 March 2013, at 08:46.